Like a spider weaving a tangled web, gender discrimination has long been a problem that seems to flourish in darkness. 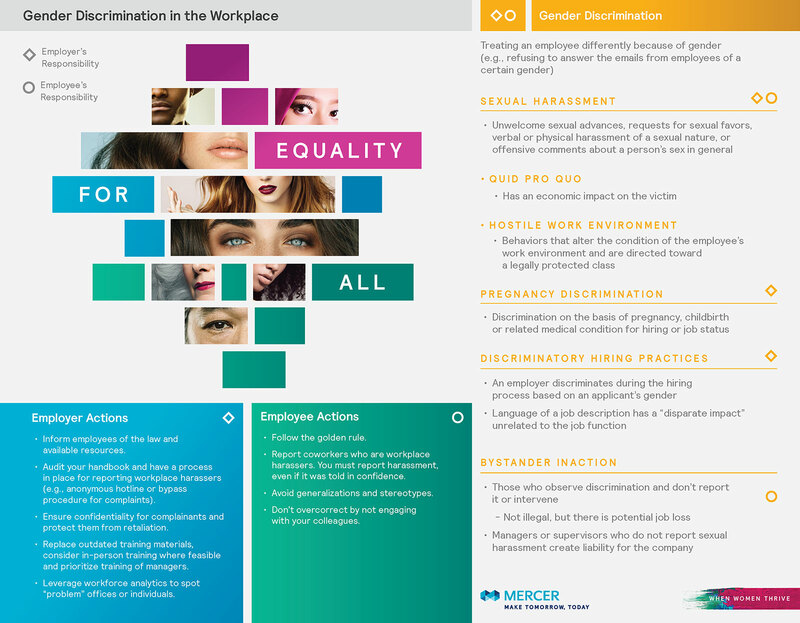 Sexual harassment, hostile work environments, pay gaps, and other acts of gender discrimination tend to rapidly multiply when those who observe discrimination don’t report it, or fail to intervene. Bystander inaction isn’t illegal, but managers or supervisors who do not report inappropriate behavior can create liability for their company. Whether small or large, hidden acts of discrimination, negligence or aggression spin their webs around our lives—paralyzing, silencing and creating both confusion and harm. As we set out to understand what actions companies and individuals should take to end sexual harassment and gender discrimination, we realized we needed to deconstruct the problem first. Albert Einstein is often quoted as saying, “If I had only one hour to save the world, I would spend fifty-five minutes defining the problem, and only five minutes finding the solution.” So, how do we define the problem? Physical or verbal harassment — how do we stop it? Victims of sexual harassment or those who have experienced unwelcome acts are feeling uncomfortable or afraid of speaking up. Leadership is covering up or failing to report incidents of sexual harassment or discriminatory acts, creating liability for their company. Those engaging in the offensive behavior are failing to acknowledge or take responsibility for their roles, even when directly confronted. The good news is, the flood lights are on. All the way on. We are experiencing a unique moment of illumination in the history of humanity. Over the past months, women and men have come forward by the thousands and used their own stories to shine light into the darkest corners of gender discrimination and sexual harassment. Beginning with the venture capital community, companies have also begun to step forward and respond. This new exposure could certainly be the solution to the first problem and even the second if we remove the stigma of coming forward. Most recently, we have seen a great wave of activism among women and men in the media and entertainment industry. People worldwide are joining them and leading a charge — with growing impatience — to push for real change. More and more corporations are following the media and VC industries lead and declaring zero tolerance policies. While the declaration comes from a good place, in reality we haven’t yet answered the question - zero tolerance of what? And the absence of defining the “what” is making people nervous that a simple hug or inappropriate joke might ruin their career. 5. We don’t fully understand what sexual harassment is. Sexual harassment has lived in the dark for so long that many of us cannot fully articulate the difference between unlawful and simply unwelcome behavior – and everything in between. As a result, it’s no surprise that we have so many questions about how to define, categorize, and eradicate these acts? Based on initial discussions, we realized that words do matter – some acts might be offensive or annoying, but they aren’t “sexual harassment.” Although there is a legal definition of sexual harassment, what was clear was that it wasn’t very clear. As we thought through different examples of behaviors, we determined there was a gap in understanding and that gap might have some unintended consequences. Deborah Kelly, a partner with the firm of Manatt, Phelps & Phillips Law, specializes in all aspects of employment law and acknowledges that while reawakened attention to sexual harassment is to be applauded, unless the “what is it” is properly understood, a backlash could wipe out any gains made. As leaders, it is our role to promote the benefits of diversity at all levels and ensure that men and women are working collegially and not avoiding contact or interaction. Despite all of these important new discussions, Mercer still felt there was a gap in understanding. We put what we learned into an infographic which we hope will help others discern the difference between behaviors that might be obnoxious and those that are unlawful. Ultimately, the goal is for everyone—all genders—to feel safe, comfortable, and accepted at work. By working on this problem with empathy and from a common place of understanding, we can untangle the web of gender discrimination and create a culture that helps attract, retain, develop and value women as equals. We are at an inflection point – it’s time to create Equality For All.